It all began one sweltering summer night in July 2012. It was the eve of my brother’s wedding. It was hotter than balls (which translates into roughly 97 degrees Fahrenheit) and we were standing on the scorching sand of the beach where they were to be wed the following day. Sweat dripped down our faces as we practiced walking up and down the sandy aisle. All of the women were in dresses and flip flops and as we walked we kicked up sand that immediately adhered to our sticky legs. I don’t know if I am making myself clear enough, but it was hot and sandy. Yes, yes, it was also beautiful and lovely and a magical day for the couple and our families and blah blah blah. I was also in a dress. I had to go out and buy something new because I didn’t have anything that was quite right for the occasion. I felt like most of what I had was too formal for a beach rehearsal followed by a backyard BBQ dinner, or way too casual for being for a rehearsal dinner. I had a good idea of what I needed and after a short shopping trip I had purchased the perfect dress for the occasion, a short blue floral sundress. Now, the events that unfolded next are mostly my fault. I should have washed the dress first. In my excitement, and also my desire to not have to do any more work than I was already doing, I did not wash my dress. Instead I threw it into the suitcase while still in the bag that I had brought it home in. Once it was time to get ready for the rehearsal I threw on the dress and headed out into the unbelievable heat. We had a lot of fun fooling around on the beach and then at the BBQ. The night wound down and we headed back to our hotel room. Since it was such a long tiring day (and we may have had a beer or two at the BBQ) we literally walked into our room and collapsed onto the bed. We fall into sweet blissful (COOL, let’s not forget the air conditioner, doing the lord’s work that weekend) sleep. I don’t think either of us moved until that next morning when it was time for me to get up and get ready to head out for hours of primping (as is the wedding custom). When the morning arrived I got up, went into the bathroom to get into the shower, and took off my dress. At which point I made the discovery that sometime during the night I had turned into a Smurf. I was blue. As in, maybe I actually died sometime in the night and I was now a pallid ghost wandering around, doomed to haunt the Long Branch Days Inn for all eternity, blue. There was some mild freaking out on my part. After all, I didn’t want to be the blue lunatic in the pale yellow dress in all the pictures. My sister’s then boyfriend (now husband) and my boyfriend (also now husband, way to level up boys) had to run out and buy nail polish remover and then spend the better part of the morning trying to rub the dye off of me. Obviously we’re all super close now. We did the best we could and you can hardly even tell what had happened in the pictures. The only real lasting effects were that the entire inside of my yellow dress was turned blue and where my sweaty hands were rubbing along the sides of it all day was also blue. Because, well the day of the wedding also reached Hotter Than Balls on the thermometer. Sometimes we would still joke about it and how ridiculous it was that I turned blue for a day. I often tell people the story and then blame the store I purchased the dress from (obviously I don’t mention that I didn’t wash it first, I don’t want to sound like it was my fault) or the ever loving heat just melting the dress right off of me. It was funny mostly because it was in the past (trust me, that morning it was not funny). That brings us to today. 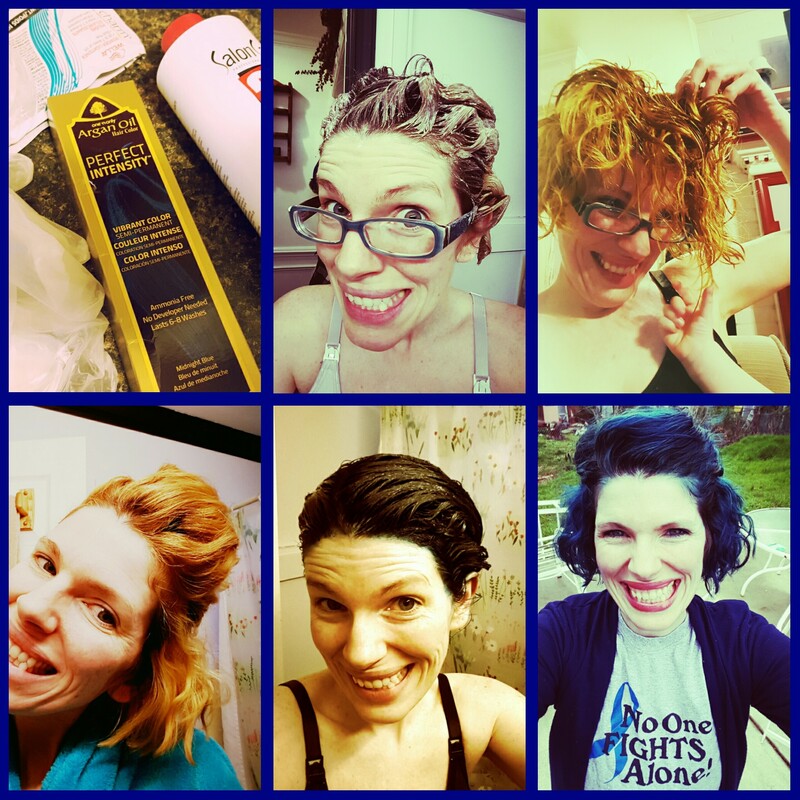 In honor of my aunt’s courageous battle against two types of cancer (one of them being colon which is represented by a blue ribbon) I dyed my hair blue this morning. I began the process by stripping my hair last night so that the blue would be really, well, blue. I discovered that there is a reason that I was not born a blonde. I am entirely too fair skinned to pull it off. Also, I know that everyone always says that blondes have more fun but I didn’t have any more fun than I normally do last night. I did, however, enjoy my daughter’s constant need to reach out and touch my hair though. So I guess that could be what they are talking about. Early this morning I got up and applied the blue color to the stripped hair. I wore gloves and took all the extra precautions that you are supposed to. I made sure to wipe off any excess dye that got onto my skin while the color set. I even used astringent to clean up the one blue streak I had on my chin from scratching an itch. Everything was perfect and I happily sat on the toilet hiding from my daughter’s hands while I waited for it to be time to rinse. This is where everything fell apart. First, my hands were instantly blue. I didn’t wear my gloves into the shower because, well that’s weird, and also because I thought having running water would prevent them from getting colored. Nay nay. So, I saw the blue hands first. Then my blue stomach. Then I noticed my blue feet that were standing in my blue tub! My entire tub turned blue. This all happened in a matter of minutes. All that careful prep work down the drain, literally. I got carefully out of the tub to get cleaning supplies and spent almost an hour in there cleaning up. Since my tub was a lovely golden yellow beforehand I had cleaned it down to a faint green color. I’m sure that it will continue to fade over time. My body is a different story. I look a little sickly. Like maybe I never really survived that wedding and have just been following my husband around, haunting his life ever since then (which he may think isn’t too far off the mark). For some unknown reason the dye that stuck to my face hasn’t yet come off my nose. So I have that going for me. I came out of the bathroom and showed off my new look to said husband. He suggested that maybe I have some weird thing in my body that just reacts to blue dyes. I guess it’s possible. I’m going to be really pissed though if my mutant ability is being able to very slowly absorb very specific shades of blue into my body. Like some super lame and terribly precise chameleon.